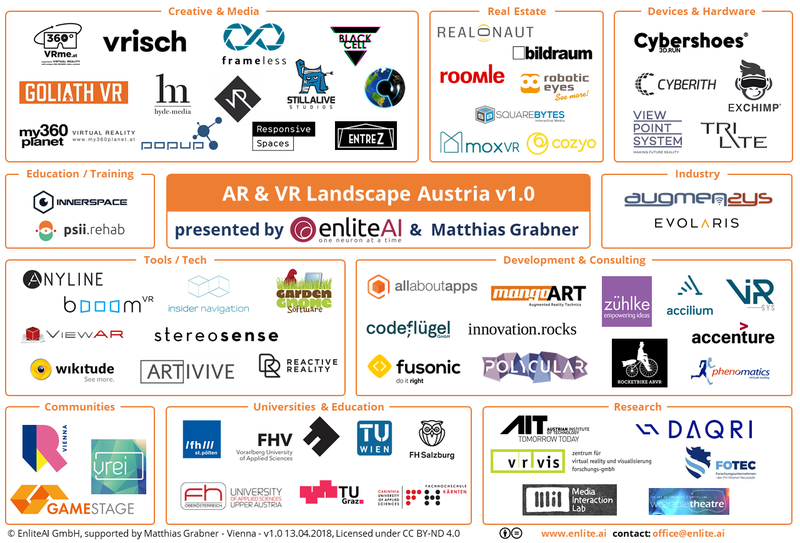 The Austrian AR/VR Landscape: An overview on companies, platforms & institutions leading the development of AR/VR technology in Austria. AI is an integral part of developing the next generation of Augmented Reality and Virtual Reality technologies. This piqued our interest to take a closer look at the AR & VR players in Austria - from companies and startups to research institutions, universities and organizations. With kind support of Matthias Grabner, a Vienna-based technology expert and export consultant, we put together the first Austrian AR & VR landscape. Disclaimer: We are not involved with any of the presented companies and organizations listed in this landscape. You’re welcome to re-use the infographic below as long as the content remains unmodified, in full and proper reference to the source is mentioned. Would you like your company or institution to be included in future updates? Simply send us an email to office@enlite.ai, we’re happy to keep track of your request. The power of AR and VR lies mainly in its ability to create new platforms which enables users to experience different types of content. Considering words of Marshal McLuhan - the medium is the message - AR and VR will build upon existing content worlds and create their very own experience defined by the characteristics of these new technologies. Given its endless visualization potential, AR & VR are especially interesting for the Real Estate industry as it gives both customers and suppliers of real estate and interior design a way to fully experience or present the objects in question. Austrian AR and VR Real Estate companies are active in all fields from architecture to real estate commodity promotion, home and interior design as well as tourism. Devices & Hardware is the interface that immerses the user into AR and VR worlds. In Austria, we found tech savvy companies developing input devices that translate body movements to virtual movement in games, track eye movement for sector specific applications, or display technologies from the world’s smallest laser beam scanner to lightweight QHD VR glasses. AR and VR Education & Training applications put the user into an environment that supports the goal of acquiring a certain skill, such as cost-saving and software supervised training for production line workers, or motivates the user to perform a certain task, such as in the application of Psii.Rehab who develop a VR based therapeutic solution for stroke patients. AR applications for Industry bring big data to the shopfloor and increase production efficiency. This section contains companies offering custom fit solutions for various applications in industry, billing, navigation, media, art and more using their own technology. In the Austrian landscape we also find Wikitude - they are developing a cross-platform SDK which is used worldwide by AR and VR developers. This section showcases companies offering developing & consulting services. One notable mention goes to consulting company Accilium, which successfully launched their own VR conferencing solution for international Fortune 500 companies. This section contains Organizations & Communities that promote AR and VR by offering opportunities to network and exchange ideas and by promoting the technologies to the public. Vienna-based Vrei, which was among the first in Austria to create a space for the local VR community and foster exchange in games, art and social applications. Austrian universities include AR and VR in a number of their information technology, computer science as well as media & communication studies majors. In addition, the University of Applied Sciences in Salzburg is hosting the VR summit, a conference focusing on applications in entertainment, health, tourism and mobility. Extra-university research facilities are small in number but contribute substantially to AR & VR related science and applied research. Especially VRvis is very active by offering a wide scope of service and hosting events to improve the public’s understanding of AR & VR and its capabilities.